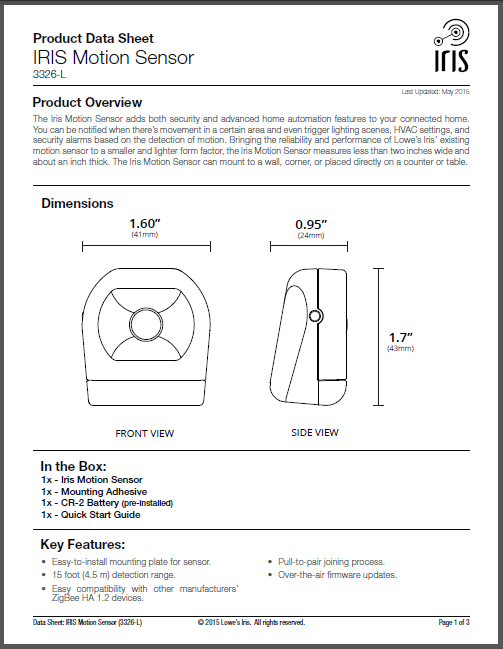 Setup instructions for the new, unreleased Motion Sensor. During our ongoing search of recently filed FCC documents it was revealed that a new Iris Motion Sensor is in line to replace the current motion sensor. This new motion sensor is advertised to be smaller than the current device; measuring in at 1.60″ wide x 1.70″ tall x 0.95″ thick. Like the current motion sensor, it will be powered by a single CR-2 lithium battery with an estimated life of 2 years. However unlike the existing motion sensor, the documents do not specify if the revised model retains the temperature sensor. 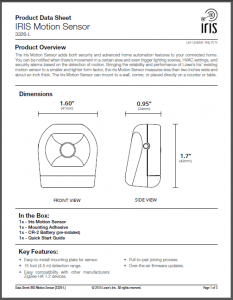 The package will include the Motion Sensor, pre-installed CR-2 battery, mounting adhesive, and User Guide. One interesting feature of this new device is referred to as “Pull-to-Pair”, where removing a plastic tab from the battery compartment is all that is required to setup the device. It appears that Lowe’s is doing away with the need to take devices apart to install the batteries as part of the setup process. The documentation refers to a possible new feature of Iris; the ability to turn off lights in areas that have not had activity after more than 15 or 30 minutes. The documents also make no mention of the ability to adjust sensitivity which has long been a long standing source of frustration for many. No word yet on when this will be released, however it may be some time while existing stock is closed out.